A bomb on a bus carrying government workers in northwestern Pakistan has killed 19 people and wounded 25, police say. Four women and two children are among the dead. 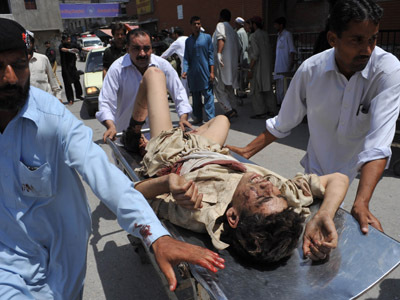 The vehicle was passing the outskirts of the city of Peshawar carrying around 40 people, when the incident happened. The bus was traveling to the nearby town of Charsadda. The Khyber-Pakhtunkhwa province, of which Peshawar is the capital, borders little-controlled tribal areas along the Afghan border. The city has seen a number of bomb attacks from Taliban militants.